A classy Hispanic horror pic written and directed by the Mexican cinephile who made Cronos and Mimic. Like many Spanish movies about the Civil War, it filters that traumatic conflict through the partly comprehending eyes of a child. After his Republican father dies in battle, 10-year-old Carlos (Tielve) is left in a desert orphanage, where crippled widow Carmen (Paredes) and kindly Professor Casares (Luppi) hope to protect their charges from advancing Fascists. But danger exists inside the fragile sanctuary, too - not only does Carlos clash with older bully Jaime, but there's surly, self-serving janitor Jacinto (Noriega) to worry about, not to mention chilling rumours about a kid who went missing. If only for its technical aspects, this would rate as a pleasurably superior supernatural psychological thriller, with polished but subtle special effects, painterly, atmospheric cinematography and vivid performances from a top-notch cast. What lifts it, however, is an adept use of generic elements as a poetic/metaphorical gloss on political and historical realities. Hence a ghost mystery becomes a tale of opposing forces building to a deadly, explosive denouement in which concealed passions finally burst forth. The Devil's Backbone is rich in metaphor between the real,historical and supernatural realms.The richness comes from the symbiosis of childhood wonder,it's ability to inhabit states of change and metamorphosis and The Spanish Civil War,it's trauma in the Spanish mind and it's effects on Spanish life.The subject of ghosts,the suspension of trapped emotion.The divisions within and without.The unexploded bomb in the yard is an apt symbol.Dr. Casares and Carmen run the orphanage for boys who have lost their parents in the civil war.There is the fear of the arrival of the Nationalists coming to a communist stronghold. There is also Jacinto the surly young janitor who oppresses the children and threatens them if they are found in the wrong place. 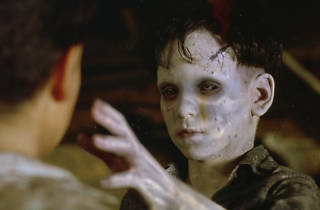 Jaime,one of the orphans saw how Santi died at Jacinto's hands and was dropped into the murky pool inside the house.Dr. Casares is in love with Carmen, the widowed cripple who teaches the orphans, keeps gold in a safe for 'the cause' and makes love to Jacinto. Jacinto is aware the gold is being given to communists and wants to get it and leave with his girlfriend, Conchita. Carlos sleeps in the bed of Santi who was killed and he makes connection with him and is whispered to by him and followed by him'the one who sighs'.Dr. 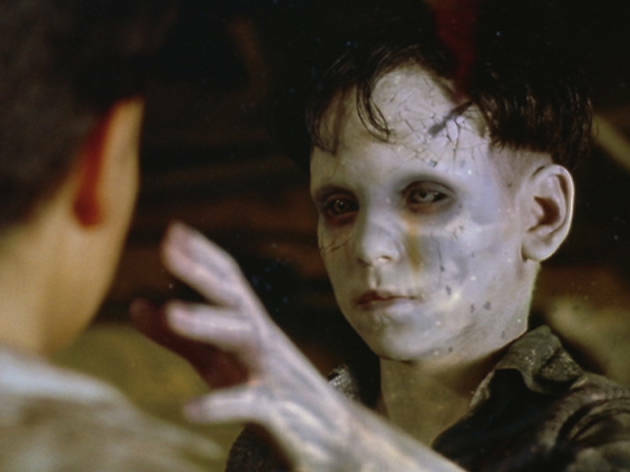 Casares is a scientist and does not believe in things like 'the Devil's Backbone' he says showing a stillborn baby in a jar of rum.This comes from the sickness of fear.All he sees is poverty and disease. One day he drives Jacinto out of the orphanage due to his ill treatment of Carmen. However he tails back and sets light to a room with petrol in and there is a massive explosion which kills several children and Carmen. Casares though badly wounded sits guard looking out over the horizon for any approach of Jacinto.Jacinto does return with fellow criminals to get the gold once Casares dies.He locks up the kids and proceeds to search the rooms,digging through the rubble.Santi has told Carlos to bring Jacinto to him. Jacinto's men drive off not believing there is any gold. Jacinto finds the gold in an atrificial leg. The children bait Jacinto and as he's about to shoot he is speared by a pole.He is driven into the pool like a wounded bull and with the weight of gold in his pockets he sinks until Santi claims him at the bottom.The children go off leaving the ghost of Dr. Casares watching them. The whole design of the orphanage with the use of the two chief colour schemes the cool blue of night and interior scenes and the warm orange and yellows of the days of hot summer sunshine,conveying a sense of warm earth and dry air.It's a marvellous depiction of childhood filteredf through the Spanish Civil War.